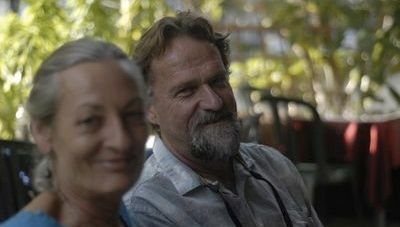 Sandra Ward (a founding member of the Santa Cruz Community Farmers' Markets) and her husband Ken Kimes. New Natives is a Santa Cruz based microgreens, sprout and mushroom farm started by Sandra Ward and Ken Kimes in 1982. Sandra states, “We started very green but, curious and eager to embark on a creative endeavor where we would learn much and possibly make a living”. Developing the growing system and many processes on their own, the two worked day and night spurred by increasing demand. Over three decades their tiny production in a garage blossomed into a business with 10 employees producing over 2,000 lbs. weekly. With your health in mind, New Natives harvests their microgreens in the sprout stage when the plant is feeding from the seed. This stage is noteworthy for a high concentration of vitamins and enzyme activity in addition to flavor. To find their spectacular array of sunflower, broccoli, scallion and arugula shoots, aside a spread of colorful mushrooms and tasty sprouts, stop by their farmstand at the Live Oak or Downtown Santa Cruz Farmers' Market. Sprouts, because they are a quick rotation crop, are inherently pest free. Insects and other possible pests don’t have time to establish themselves.